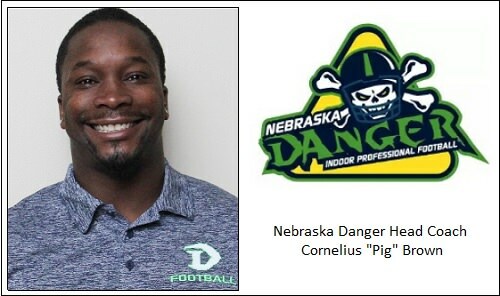 GRAND ISLAND, NE - Less than two weeks after the Nebraska Danger's season ended, they've hired their head coach for 2019. The team announced today that Cornelius "Pig" Brown will take over the reigns permanently for the team going forward. Brown has served as co-interim head coach since the Danger dismissed Mark Stoute on May 20. Brown shared to co-interim head coaching duties with veteran IFL head coach Adam Shackleford during the last three games of the regular season, and in Nebraska's United Conference Championship Game loss to the Iowa Barnstormers. Brown served the first 11 games of the season as defensive coordinator, while Shackleford spent that duration as offensive coordinator. Brown was also defensive coordinator for the Danger in 2017. Brown, a key defensive player for four seasons in Nebraska from his linebacker position. is one of three former Indoor Football League players who will be inducted into the IFL Hall of Fame this weekend. He joins former Danger quarterback Jameel Sewell and Sioux Falls Storm offensive lineman Charlie Sanders as the 2018 inductees into the Hall. Brown accumulated 319 total tackles, 15.5 sacks and nine interceptions during his IFL career, and was a coach in the huddle and leader for the defense; the "heart and soul of the Danger defense," per the IFL's press release announcing his elevation to the head coaching position. "It is truly an honor to coach for one of the IFL's most respected programs, and I appreciate the passion of this ownership group and staff," Brown said in the press release. "Central Nebraska has some of the greatest fans in the nation, and I am thrilled for the opportunity to take over and grow the Danger program"
The Danger finished their 2018 regular season at 4-10, advancing to the playoffs, where they were knocked off by the Barnstormers, 48-17, in the semifinal game. Iowa advanced to its first-ever United Bowl with that win. Team owner Charlie Bosselman said that Brown represents the continued tradition of Danger football. "Pig has been a part of the Danger tradition for a long time, first as a player and then as a coach, and played an instrumental part in winning our three Intense Conference Championships," Bosselman said n the release. "We felt that he was a great fit to be our next head coach." The early move allows Brown to assemble his assistant coaching staff, and begin scouting players for next season. The tenth United Bowl (or United Bowl X, if you prefer) will be July 7 at 5:05 p.m. pacific (7:05 central), featuring the first seed Barnstormers hosting the third seed Sioux Falls Storm at Wells Fargo Arena in Des Moines, Iowa. SCtoC's preview of the United Bowl will be posted mid-week. On July 1, this site announced honors for the top players in the league over the 2018 regular season. Click Golden Helmet Awards to see those awards and summaries.